This site provides information about current, past, and future EarSay projects, as well as news updates, press kits, press clippings, mission statement, bios, info on resources, associate artists and organizations, how to give, how to buy things and how to get in touch. EarSay is an artist-driven non-profit arts organization dedicated to uncovering and portraying stories of the uncelebrated. Founded by Warren Lehrer and Judith Sloan in 1999, our projects bridge the divide between documentary and expressive forms in books, exhibitions, on stage, in sound & electronic media. We are committed to fostering understanding across cultures, generations, gender and class, through artistic productions and education. We bring our work to theatres, museums, schools, festivals and universities. Scroll over the top menu to view projects, get information, shop, etc. Join us on Saturday March 23rd at the Jamaica Performing Arts Center. 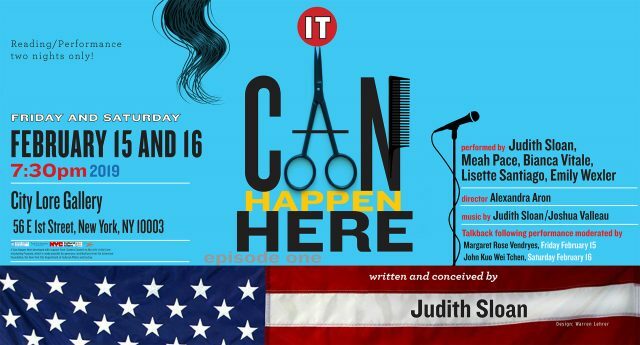 Come at 4:30 for Cocktails and Conversation with some of the actors from It Can Happen Here to support the future of the work. Stay to see the concert at 7pm. 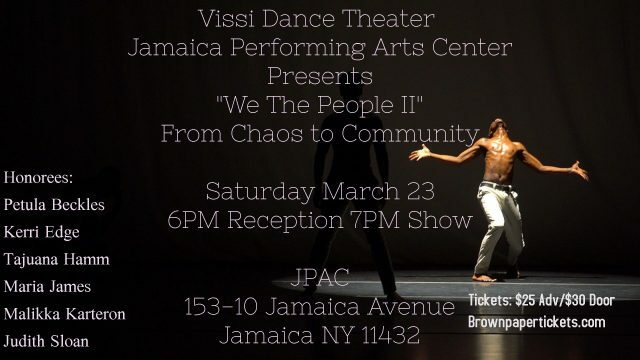 Vissi Dance Theater is honoring 6 recipients for outstanding service to our community in recognition of Women’s History Month: Petula Beckles, Kerri Edge, Tajuana Hamm, Maria James, Malikka Karteron and Judith Sloan. Performed by Meah Pace, Judith Sloan, Lisette Santiago, Bianca Vitali, and Emily Wexler. Warren Lehrer wins a 2018 Indigo Design Award in Mix Media/Moving Image for 1001 Voices: A Symphony for a New America. It was one of four recipients given by the prestigious international design competition in the Motion Graphics category. The motion graphics runs throughout the 38 minute work and is an integral component of the multimedia symphony. 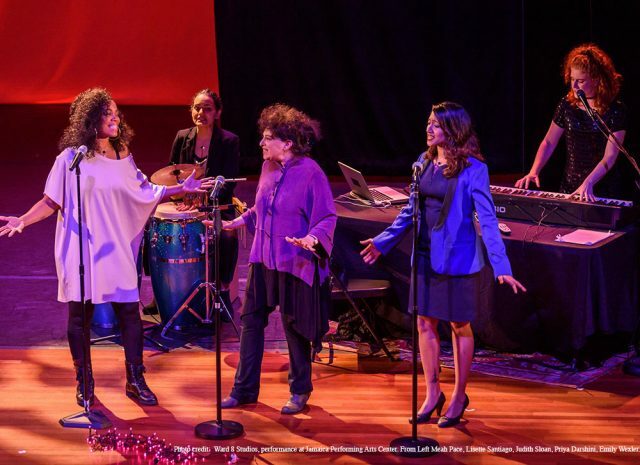 This 13 minute excerpt reel is made from the December 2017 performance at the Kupferberg Performing Arts Center. Music Director James John. 1001 Voices: a Symphony for a New America is a three-movement symphony/oratorio scored for orchestra, chorus and visual projections. The multimedia work is about migration, transformation, and the search for home. It is a 21st century, musical/poetic expression of the challenges and aspirations of so many of today’s American cities and their inhabitants who hail from many different parts of the globe. It is inspired by stories of immigrants and refugees in Queens, NY—the most ethnically diverse locality in the United States. 1001 Voices serves as an antidote to the poisonous and flattening rhetoric about immigrants and refugees currently dividing the United States and the globe. 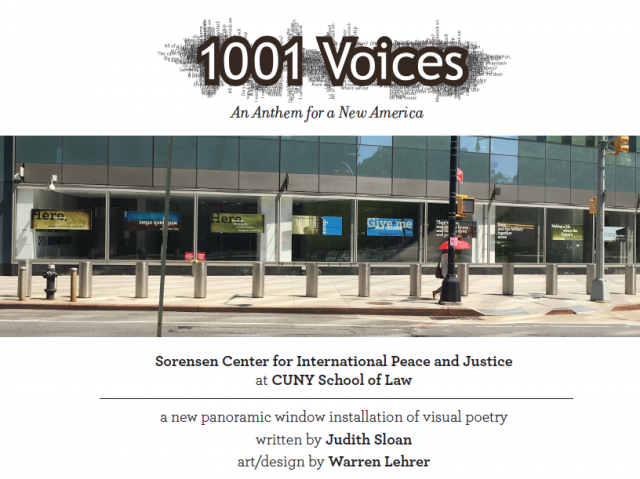 1001 Voices is a collaboration between Grammy-Award-winning composer, trumpeter, and Klezmatics band member Frank London, EarSay’s Judith Sloan and the animated projections designed by EarSay’s Warren Lehrer. 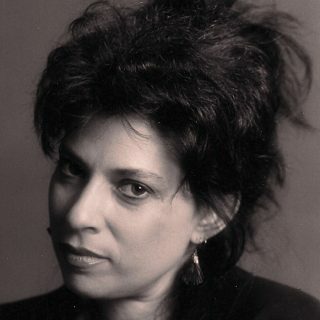 Originally commissioned and premiered by the Queens Symphony Orchestra, this work can performed by full orchestras and choirs as well as by smaller orchestras and contemporary music ensembles and as few as four vocalists. Scores are available upon request. If you’re interested in the possibility of performing this work or want more information, contact: [email protected]. On Wednesday April 18, 2018, Warren Lehrer presented a performance of A LIFE IN BOOKS: The Rise and Fall of Bleu Mobley at Pratt Institute as the launch event for their new Book Arts Program. In his funny, thought provoking performance/reading based on his illuminated novel A LIFE IN BOOKS: The Rise and Fall of Bleu Mobley, Warren presents an overview of his protagonist’s life in books via many of Mobley’s book cover designs, book-like objects, and other biographical materials including animations and video performances of Mobley book excerpts. A LIFE IN BOOKS: The Rise and Fall of Bleu Mobley is an illuminated novel that contains 101 books within it, all written by Lehrer’s controversial author protagonist who finds himself in prison looking back on his life and career. In his funny, thought provoking performance/reading, Lehrer presents an overview of Mobley’s life in books via many of his book covers, book-like objects, and other biographical materials including animations and video performances of book excerpts. This Window Exhibition was on view at CUNY School of Law from May 2017 through February 2018. We are currently seeking a new home for the installation. in collaboration with the Queens Choral Society and the Aaron Copland School of Music, 900 people came to see the full performance of 1001 Voices. Video excerpts coming soon. Queens Council on the Arts announces four selected artists for the Inaugural Year of the Artist Commission Program. Judith Sloan hosts an event for her commission of a new work “IT CAN HAPPEN HERE” a new theatrical performance developed from gathering stories of anguish and defiance in the face of xenophobia and repression. Sloan will present excerpts of the work in progress accompanied by Andrew Griffin on Viola. 1001 Voices: A Symphony for a new America. A collaboration between EarSay and the Queens Choral Society and the Aaron Copland School of Music with 120 voice choir. Composed by Frank London, Libretto by Judith Sloan, Animations by Warren Lehrer. Saturday December 16, 2017 at Colden Auditorium. Thursday July 27 Brunswick, ME. “Every year The Center for Book Arts honors three important people who have and continue to inform the book arts field, such as curators, librarians, collectors, organizations, and, of course, artists.” Lehrer was recognized as one of the 2016 honorees at this year’s Center for Book Arts Gala Benefit on April 4th at the National Arts Club in NYC. The other honorees this year were May Castleberry, librarian at MoMA, and Peter Kraus, proprietor of Ursus Books. 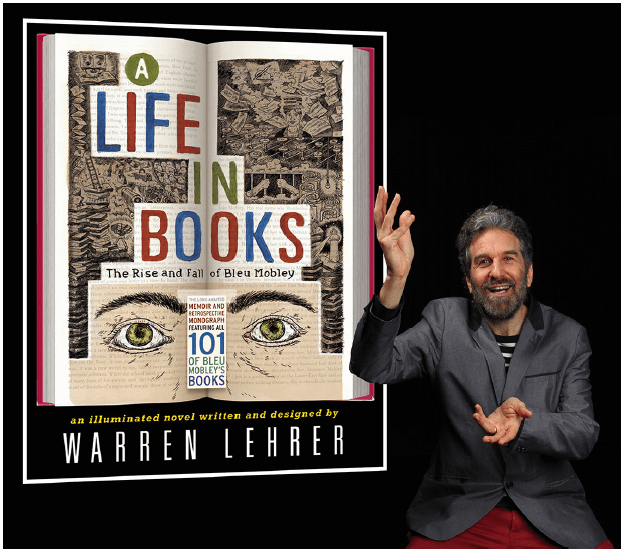 On March 24 Warren Lehrer premiered the A LIFE IN BOOKS: Bleu Mobley Retrospective Exhibition at the O’Kane Gallery at the University of Houston, Downtown. Based on Lehrer’s award-winning illuminated novel A LIFE IN BOOKS, the exhibition presents itself as a retrospective of Bleu Mobley’s life work. It encompasses over 250 pieces, including all 101+ Bleu Mobley book jackets, accompanied by “original” catalogue descriptions, select interior pages, book-like objects, animations and video performances of book excerpts, and facsimiles of letters, articles, notebooks, and other artifacts that help tell the Bleu Mobley story. A LIFE IN BOOKS: The Rise and Fall of Bleu Mobley is an illuminated novel that contains 101 books within it, all written by Lehrer’s protagonist—Bleu Mobley—a controversial author who finds himself in prison looking back on his life and career. Mobley’s autobiography/apologia is paired with a review of all 101 of his books, each represented by its first-edition cover design and catalog copy, and more than a third of his books are excerpted. The resulting retrospective contrasts the published writings (which read like short stories) with the confessional memoir, forming a most unusual portrait of a well-intentioned, obsessively inventive (if ethically challenged) visionary. A LIFE IN BOOKS explores the creative process of a writer/artist, as it reflects upon a half century of American/global events, and grapples with the future of the book as a medium, and the lines that separate and blur truth, myth, and fiction. In his funny, thought provoking performance/readings, Warren Lehrer presents an overview of Bleu Mobley’s life in books via many of Mobley’s book cover designs, book-like objects, and other biographical materials including animations and video performances of Mobley book excerpts. 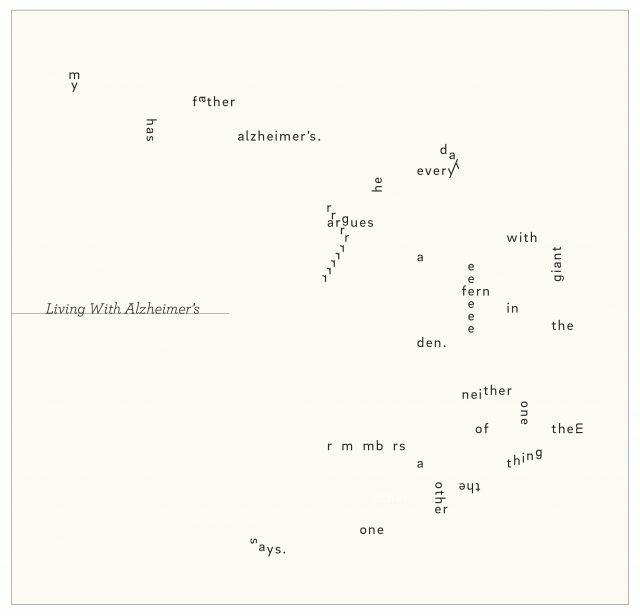 Lehrer recently completed a book of visual poetry in collaboration with the investigative journalist and poet Dennis Bernstein titled The Bullet That Pierced His Son’s Skull. Bernstein’s poems, Lehrer’s visualization. The book contains 254 poems, eight chapters, and runs 340 pages. To be published sometime next year. Stay tuned! Join mailing list for updates on performance, tour dates, exhibition, and enhanced e-book edition.